This .925 silver baby bracelet you tell your little girl "I love you to the Moon and Back '. Luxury wrapped in a gift box. 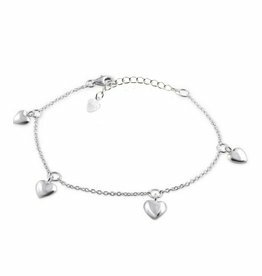 Lovely baby bracelet with four small hearts (hollow back). The bracelet is made of .925 silver and is adjustable from 11 cm (from 3 months) to 13 cm (2- 3 years). This way your little girl can have extra long fun of it. 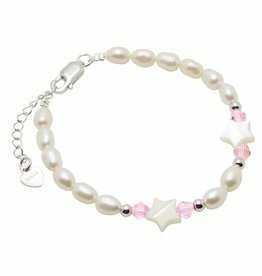 Not everyone love charms, especially for the little ones are freshwater pearls combined with crystals enough! What they will shine with this bracelet, and later a nice tangible memory.